and welcome to Tintin Heart. 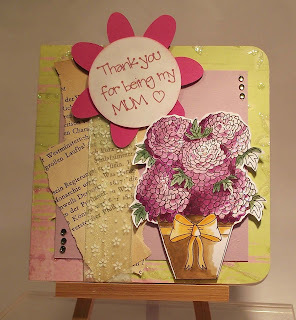 Today I am posting my DT card for the "Flowers for Mum" challenge running over at The Crafty Pad. The challenge is being sponsored by Digital Downloads by L.R. Designs and there is the chance to win a voucher for her on-line store.So pop along a take a peek and give it a try. I have used one of The Crafty Pad digi stamps to make my Mum a "Pot Mum" to thank her for being my Mum. I really like this digi stamp alot. There's lots of detail and as you can see from the other DT cards, lots of ways to present this splendid pot of Chrysanthemums. Thank you for taking the time to stop by and read my blog. Your time and comments are appreciated.